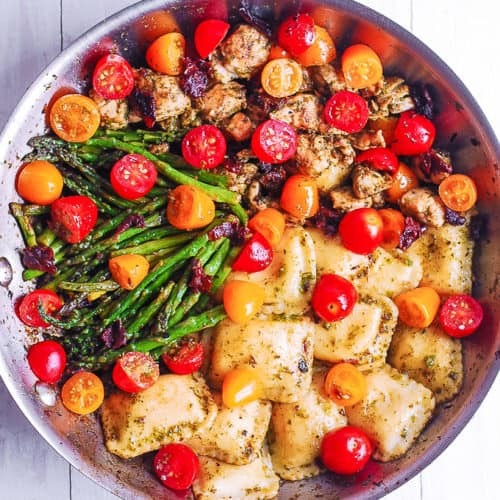 Chicken Ravioli Skillet with Basil Pesto and Veggies – easy and quick gourmet pasta meal! 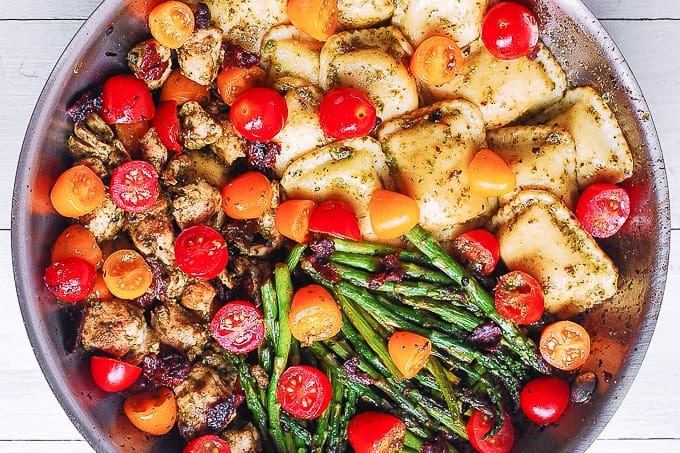 This family-friendly weeknight dinner is packed with vegetables: asparagus, fresh tomatoes, and sun-dried tomatoes! Ravioli is an amazing Italian pasta, and there are so many different ways to serve it. One of my favorite recipes is mushroom ravioli with spinach. I’ve also served Italian ravioli with artichokes and sun-dried tomatoes. In this recipe, I combined chicken and ravioli with the basil pesto and veggies. The flavors are amazing. The presentation is beautiful. Chicken ravioli with pesto and veggies look like a gourmet meal from a fine dining restaurant. Your family will love this Italian style dinner! I knew this recipe would be a success because it was inspired by pesto chicken tortellini and veggies which is a very popular recipe on my site. Quick and easy. The recipe takes only 40 minutes! 8 ingredients. 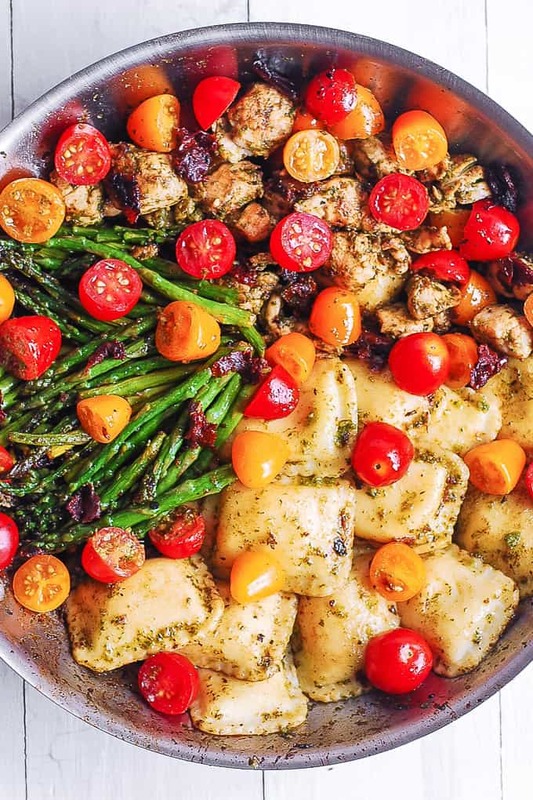 This simple dinner requires only 8 ingredients: olive oil, chicken, ravioli, asparagus, cherry tomatoes, sun-dried tomatoes, basil pesto, salt. Packed with fiber and protein. Many ravioli recipes feature creamy sauce or tomato sauce. This recipe has neither. Instead, it’s packed with vegetables (tomatoes and asparagus). Chicken provides protein. I use basil pesto as the sauce for coating the chicken and ravioli. Comfort food made healthier. There are lots of veggies in this recipe! This dinner combines comfort food (pasta) with healthy ingredients (vegetables). Your family will love it! What I really like about this chicken ravioli recipe is that it’s so easily adaptable. Use any kind of ravioli. I used store-bought ravioli. You can use any type of ravioli: cheese ravioli, pesto ravioli, mushroom ravioli, etc. You can even make your own homemade ravioli if you like. What is a good substitute for ravioli? Use tortellini. Use any type of tomatoes. I used cherry tomatoes. Grape tomatoes or regular tomatoes will work great, as well. Don’t have asparagus? Use green beans instead! Use any type of chicken meat: chicken breasts, tenderloins, chicken thighs. Just make sure it’s skinless and boneless. You can even use left-over cooked chicken. Just throw it together with ravioli and basil pesto in this recipe! This beautifully green basil pesto has pine nuts, parmesan cheese, garlic, olive oil, and lemon juice. This fresh basil pesto takes only 15 minutes of prep. And this recipe for homemade pesto is so delicious! There is always option #4 – purchase a pre-made basil pesto in the store! Refrigerate chicken ravioli for up to 4 days in a covered air-tight container. Reheat on medium heat in a large skillet for about 5-10 minutes. Serve ravioli with mushrooms and spinach. Smother ravioli with creamy Parmesan sauce. Make ravioli with tomato cream sauce. Dress up Italian ravioli with spinach, sun-dried, tomatoes, artichokes, and capers. What is a good side dish with ravioli? Salad. A fresh simple salad is a great choice! Just toss together some spinach or arugula with olive oil and balsamic vinegar. Or, make basil pesto salad with tomatoes, avocado, and cucumbers. If you like beets, try beet salad with spinach, cashews, and goat cheese. Bread. Grab a baguette or a loaf of Italian bread at the store. Or, make your own easy bread in a bread machine. 1) First, add sliced chicken breast with chopped sun-dried tomatoes and olive oil to a large skillet. Cook on medium heat for about 5-10 minutes until the chicken is cooked through. 2) Then, remove the chicken and the sun-dried from the skillet, leaving the oil in. 3) Next, add asparagus, seasoned generously with salt, and 1/4 cup of sun-dried tomatoes to the same skillet. Cook on medium heat for about 5-10 minutes. Remove the asparagus to a plate. 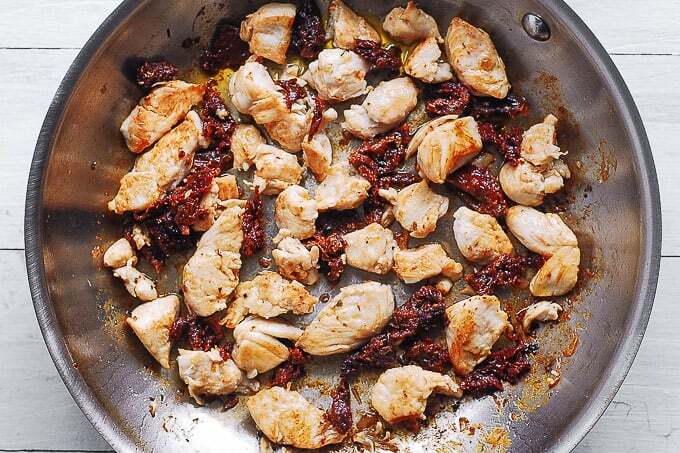 4) Add cooked chicken with sun-dried tomatoes back to the skillet. Mix with basil pesto on low-medium heat for about 1 or 2 minutes. 5) Add cooked ravioli and halved cherry tomatoes to the skillet with the chicken. Stir to combine. Add back the cooked asparagus. 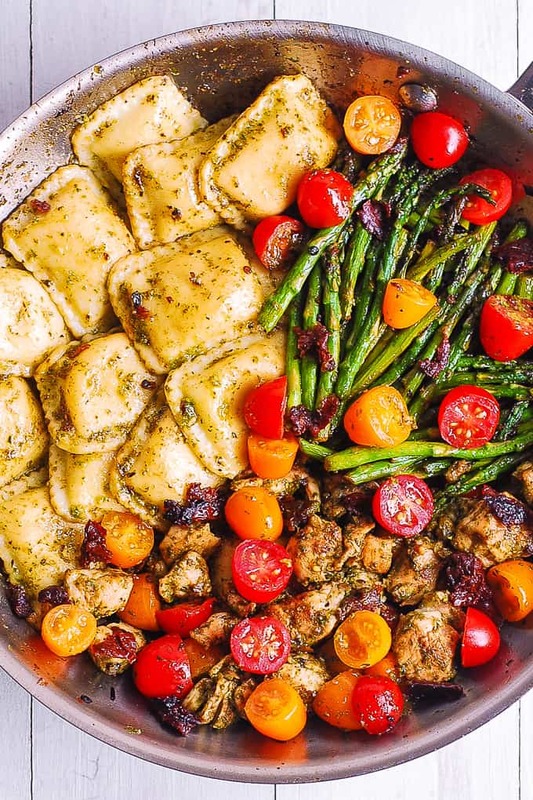 Chicken Ravioli Skillet with Basil Pesto and Veggies is an easy pasta dinner! This gourmet meal takes only 40 minutes! 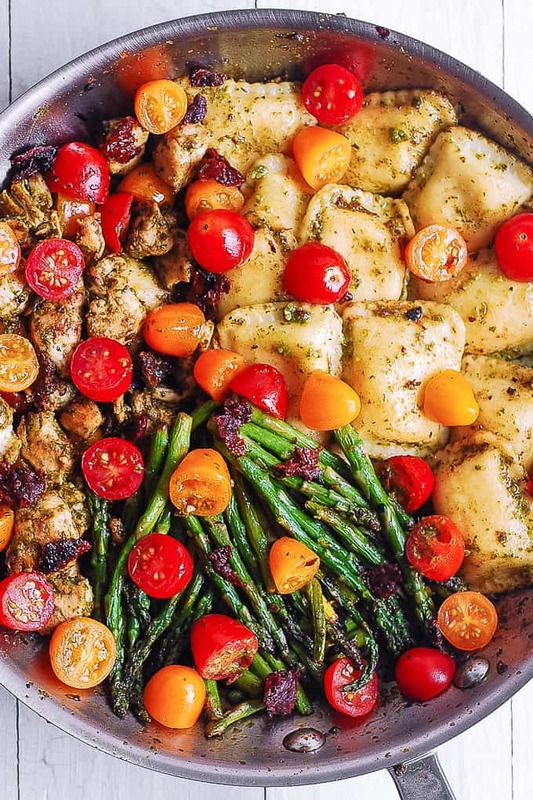 Packed with protein and vegetables: asparagus, fresh tomatoes, and sun-dried tomatoes! In a large skillet heat 2 tablespoons olive oil on medium heat. Add sliced chicken breast (seasoned with salt) and 1/4 cup of chopped sun-dried tomatoes. Cook everything on medium heat for 5-10 minutes, turning chicken slices over a couple of times until the chicken is completely cooked through. Remove the chicken and the sun-dried from the skillet, leaving the oil in. 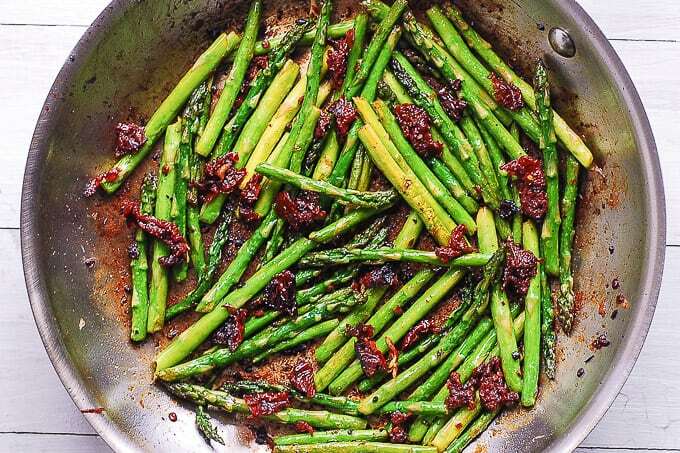 Add asparagus (ends trimmed), seasoned generously with salt, and 1/4 cup of sun-dried tomatoes to the same skillet. Cook on medium heat for 5-10 minutes until the asparagus is cooked through. Remove the asparagus to a plate. Cook ravioli according to the package instructions, drain. 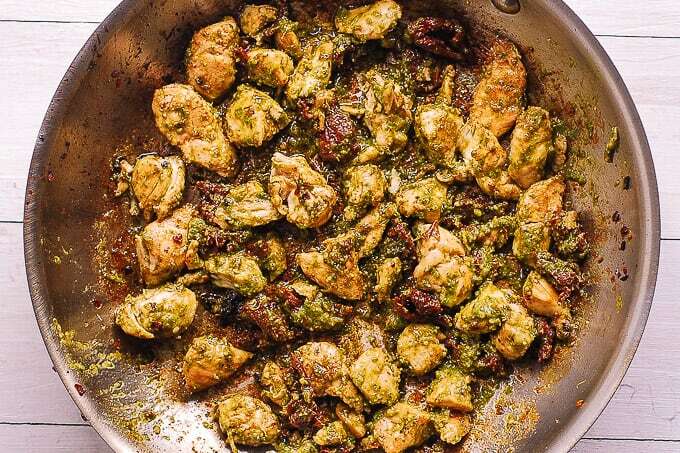 Add cooked chicken with sun-dried tomatoes back to the skillet. Stir to coat and cook on low-medium heat until the chicken is reheated, 1 or 2 minutes. Remove from heat. Add cooked ravioli and halved cherry tomatoes to the skillet with the chicken. Stir to combine. Add more pesto if desired. Season with more salt if needed. 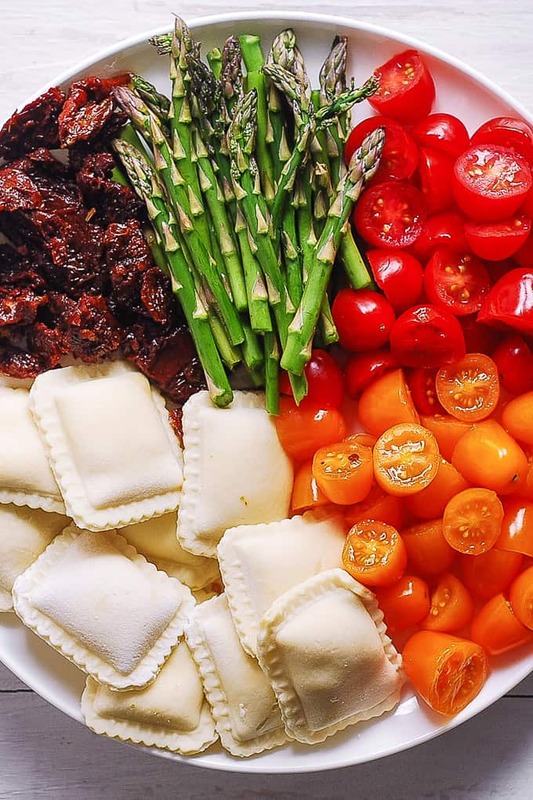 Serve the chicken, ravioli, and cherry tomatoes together with asparagus. Made this last night and it was so good! I had thighs and green beans laying around, so used them instead. Super yummy and filling – made a LOT so we have leftovers YAY. Thank you for such a wonderful comment! So glad you enjoyed this recipe! Using green beans is a great idea! For some reason I can’t get picture to post but we Made last night. Delicious, I would add some sprinkle cheese over it when complete. I am so glad you liked this recipe! Sprinkling some cheese over the chicken ravioli is a great idea! Just made it with leftover chicken. Everybody loved it! Thank you for the recipe!